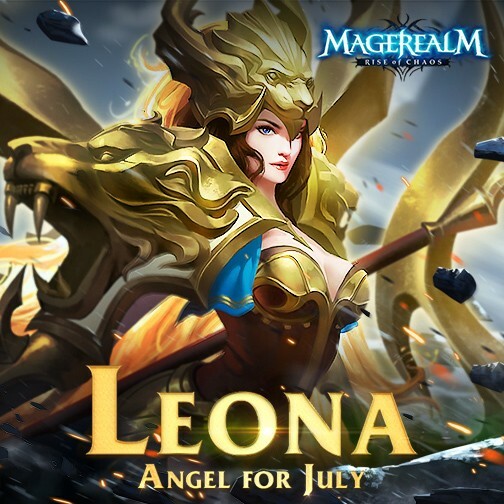 We're excited to announce a new Angel to join Realm -Leona, the Pride of the Angels! This fierce and noble Angel has finally made her way to the Mage Council and is eager to leap into the fray against the forces of darkness. Leona’s title as Pride of the Angels was not given to her lightly. She has earned it time and time again with her valor both on and off the battlefield. During times of peace, Leona has used her natural leadership skills to bring her people great prosperity. But in times of war, the Pride of the Angels will don her Golden Lion armor and become a beacon of hope on the battlefield. In battle, Leona uses her legendary greathammer Shadowbane to crush evil wherever it may rear its head. Her combat skill, Feral Smite, causes massive damage to all enemies in an area and reduces their Pierce rate by 20% for a short duration. Mainly playing an offensive role, Leona is the ideal Angel for players looking to add more power to their team. Are you excited to add Leona to your team? Follow Magerealm on Facebook and visit the official forums to get the latest news and participate in rewarding events. Come experience an epic fantasy world of magic in this free to play action MMORPG!